I have been eyeballing this game on GOG for a year because it looked cool but I always passed it over. That is until I saw the announcement of Vampire: The Masquerade – Bloodlines 2. Then at the same time, the first game was 75% off. So I said what the heck I will try it for $5. Man have I been missing out. 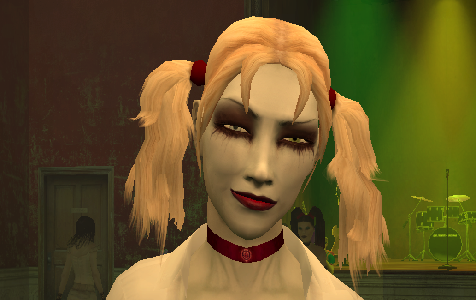 Vampire: The Masquerade – Bloodlines is a fantastic game! It is a mature RPG game with a complex systems and storys. Complex is not a bad thing here. It keeps things fun. This game has a rich lore behind it. someone could spend hours on a wiki sites reading about it all. I am still playing but the story is very cool and the characters are very interesting. I have no clue who my true friends are and who are my real enemies. It is a blast trying to figure that out! You don’t want to let humans know about vampires so you have to try and blend in. They call this the Masquerade. You can’t show off around humans or let them know you are a vampire. Doing this breaks the masquerade rules. If it happens too much then vampire hunters will come after you. Or so I am told by in-game NPCs. I think in reality it is just game over. You also have to try to keep your humanity. You have humanity points and if you do evil things you lose points and if you do good things you gain points. If the points drop to zero you lose control and become some kind of vampire beast. I have been surprised a few times already with things that happen in the game. A good video game story is way better then a good book if you ask me! The twist and revelations in this game have me hooked! There are 7 playable clans in Bloodlines. Each has there own strength and weaknesses and unique set of disciplines. Picking one clan over another can change the gameplay a lot. So clans make the game a good candidate for multiple playthroughs. 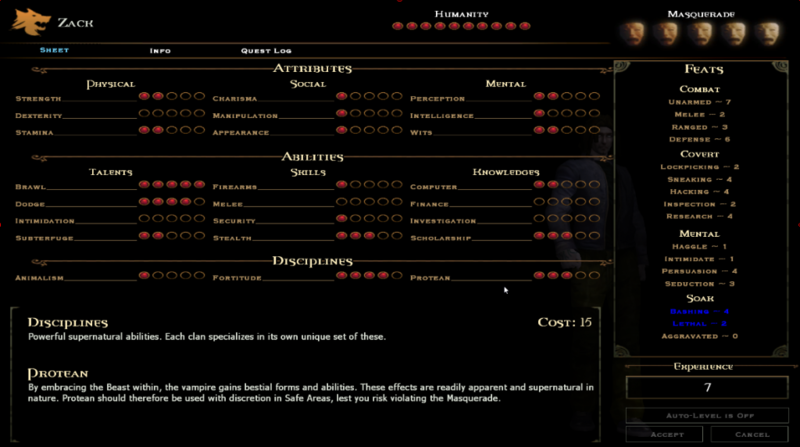 You do not level up like other RPGs. Instead, you get points and you can spend them in whatever skills you want to. Such as melee combat and Guns. Because of this a character can be played in different ways on top of the differences between clans. I am playing the game as more of a stealth guy and the stealth gameplay is fun. But you can also play with high social stats. This gives you more dialog options and the ability to talk your way in and out of things. I guess you could also just beat up and kill everyone. But you still have to balance your humanity points and masquerade violations. The combat felt a little clumsy at first but I got used to it. I am still not sure I fully understand it. But the melee attacks change based on how you are moving when you hit the attack button. Like if I am standing still I do a normal punch or swing with a melee weapon. But if I also push the forward button then I do an overhead swing thing. You can also use guns in this game. It is possible to make a character with high gun skills and go around shooting if that is how you want to play. If there is a down side it would be buying and finding ammo. I am doing a melee playthrough so I can’t say much about guns yet. But I hear the shotgun is very powerful. Disciplines are like the magic of the vampire world. But instead of using mana they are fuled by blood points. And you refill your blood points by feeding. Each Clan has its own unique set of disciplines that are passed down in their bloodline. I do not have a lot of experience with all of them but they all seem to be balanced well. You can pick any clan and still find a use for the disciplines you have access to. Stealth and sneaking play is a big part of this game. You can choose to finish missions without fighting. You also don’t want the humans to see you using cool vampire abilities. 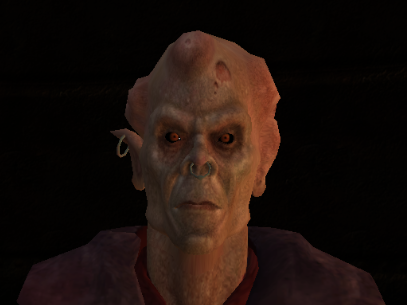 There is also a clan called the Nosferatu who look like monsters and can not blend in as humans. So you have to spend most of the game sneaking around. I love this game so far and I would recommend it to anyone who enjoys RPGs! I got my copy from GOG and it came pre-patched. I am still playing the game so I will be updating this post as I learn more. So check back later to see updates or sign up for my monthly newsletter to get reviews and reminders in your inbox! This entry was posted in Games, Reviews on April 3, 2019 by Zack.